Paul Allen's private spaceflight company Stratolaunch has just unveiled the world's biggest airplane, a massive mothership for launching rockets. The massive Stratolaunch Systems carrier plane for aerial rocket launches rolls out of its Mojave Air and Space Port hangar in Mojave, California for the first time on May 31, 2017. The aircraft will launch rockets from high-altitude.Stratolaunch Systems Corp. The colossal Stratolaunch carrier plane rolled out of its hangar at the Mojave Air and Space Port in Mojave, California, Wednesday to undergo fueling tests. It's the first public look at the full craft —which is designed to launch rockets into orbit from the sky — since construction began. 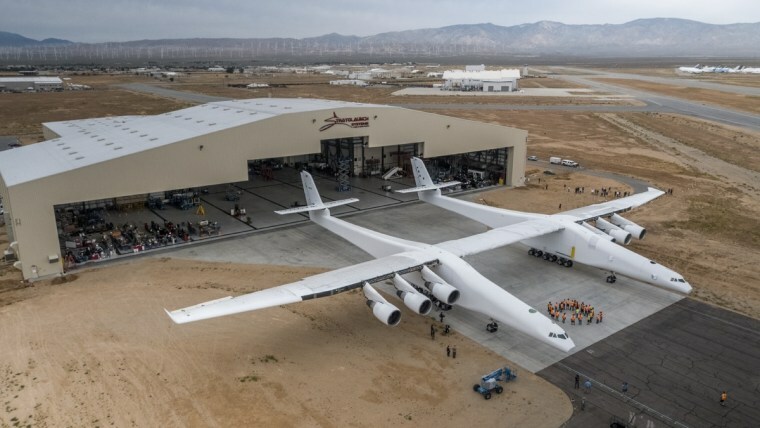 The massive Stratolaunch Systems carrier plane for aerial rocket launches rolls out of its Mojave Air and Space Port hangar in Mojave, California for the first time on May 31, 2017. The aircraft will launch rockets from high-altitude. Stratolaunch Systems Corp.
A drone's-eye view of the Stratolaunch Systems carrier plane as it rolls out of its Mojave Air and Space Port hangar for the first time. The plane has a wingspan of 385 feet (117 meters), longer than a football field. Stratolaunch Systems Corp.
A view from the twin tails of the massive Stratolaunch Systems carrier plane for aerial rocket launches. The huge craft rolled out of its Mojave Air and Space Hangar for the first time on May 31, 2017. Stratolaunch Systems Corp.
"Over the coming weeks and months, we'll be actively conducting ground and flight-line testing at the Mojave Air and Space Port," Floyd said. "This is a first-of-its-kind aircraft, so we're going to be diligent throughout testing and continue to prioritize the safety of our pilots, crew, and staff. Stratolaunch is on track to perform its first launch demonstration as early as 2019." Email Tariq Malik at tmalik@space.com or follow him @tariqjmalik and Google+. Follow us @Spacedotcom, Facebook, and Google+. Original article on Space.com. Is This Electric 'Multicopter' The Air Taxi Of The Future? Tariq Malik is managing editor of Space.com. Malik joined TechMediaNetwork's Space.com team in 2001 as a staff writer, and later editor, covering human spaceflight, exploration and space science.